The base is a 5-1/2 x 6 piece of Early Espresso cardstock, lined with DSP from the Season of Style Paperstack. 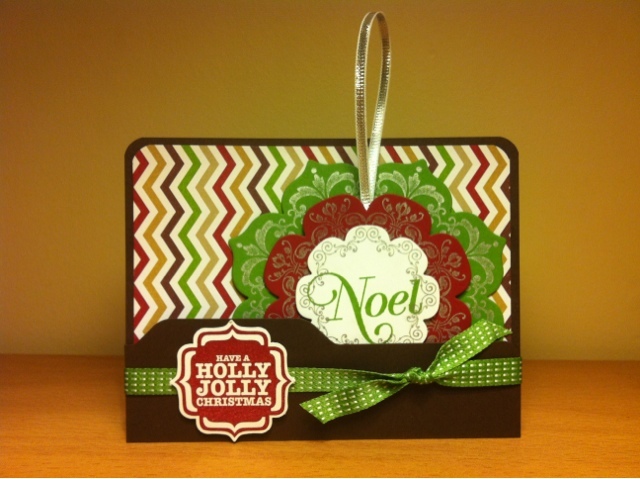 Have a Holly Jolly Christmas from Tags 4 You is stamped in Cherry Cobbler and punched out with the Label Bracket Punch. (you can get these in a bundle and save!) That cute tab you see on the Early Espresso cardstock is made with one of the punches on the new amazing Envelope Punch Board! Add it to your must have list now!! The ornament is made with the Daydream Medallions stamp set inked with the Silver Metallic Encore Pad, stamped onto Gumball Green, Cherry Cobbler and Whisper White cardstock. The layers are cut out with the Floral Frames Framelits Dies and the Big Shot. 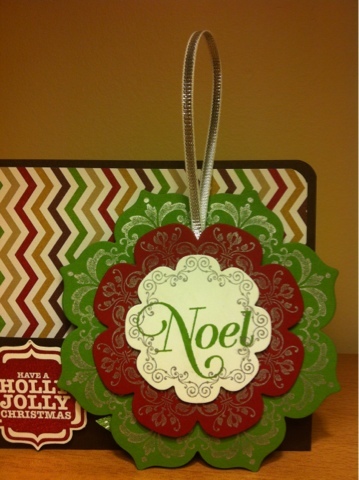 Noel is from Greetings of the Season and the hanger is made with some Silver 1/8" Ribbon from the Holiday Catalogue. Doesn't it make you want to start preparing for the holidays? This is adorable! What a cute idea by adding a little ornament! Very cool!